It was cloudy and there was intermittent rain, but some Ruby-throated Hummingbirds (Archilochus colubris) were active at Green Spring Gardens yesterday. My macro lens might not have been the optimal choice for photographing them, but it is what I had on my camera and I was pleasantly surprised by the results. As I have noted many times before, I really like my macro lens, a Tamron 180mm lens. Because of the crop sensor of my Canon 50D DSLR, the lens has an equivalent field of view of 288mm, which lets me use if as a telephoto lens in a pinch. The only down side of the lens is that it does not have any image stabilization so I have to pay attention to my shutter speed and/or use a monopod as I was doing yesterday. I noted that the hummingbirds seemed to like a particular kind of flower, so I planted myself in front of a patch of them and waited. The hummingbirds returned several times and I was able to decent shots. As I was waiting, it began to rain a bit, so I opened my umbrella and kept shooting—the hummingbirds did not seem to mind the light rain. It must have been quite a sight to see me with my umbrella in one hand and my camera on the monopod in the other. For those of you who are interested in camera settings, I was shooting at ISO 1600 in aperture-preferred mode with an aperture setting of f/5. 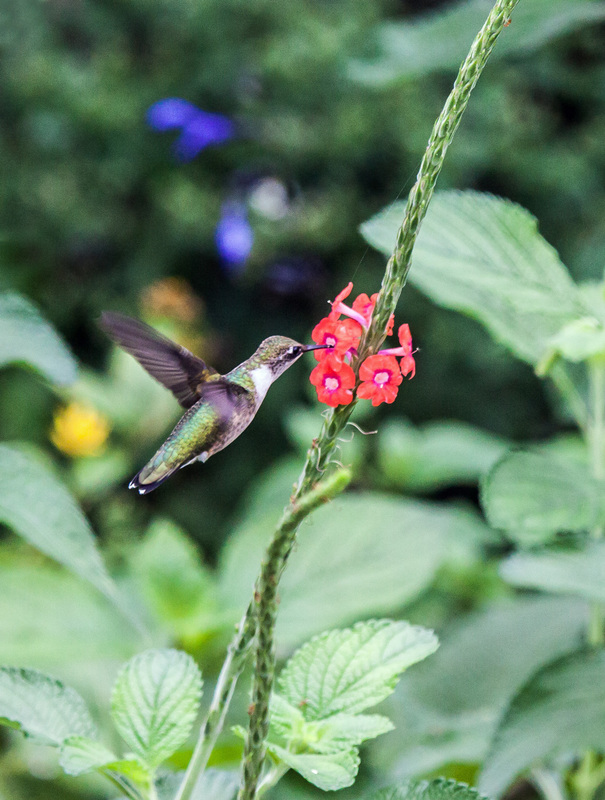 The relatively poor lighting meant that my shutter speed generally was 1/500 or slower, which was not fast enough to freeze the motion of the wings, but did allow me to capture the body fairly well when the hummingbird hovered. 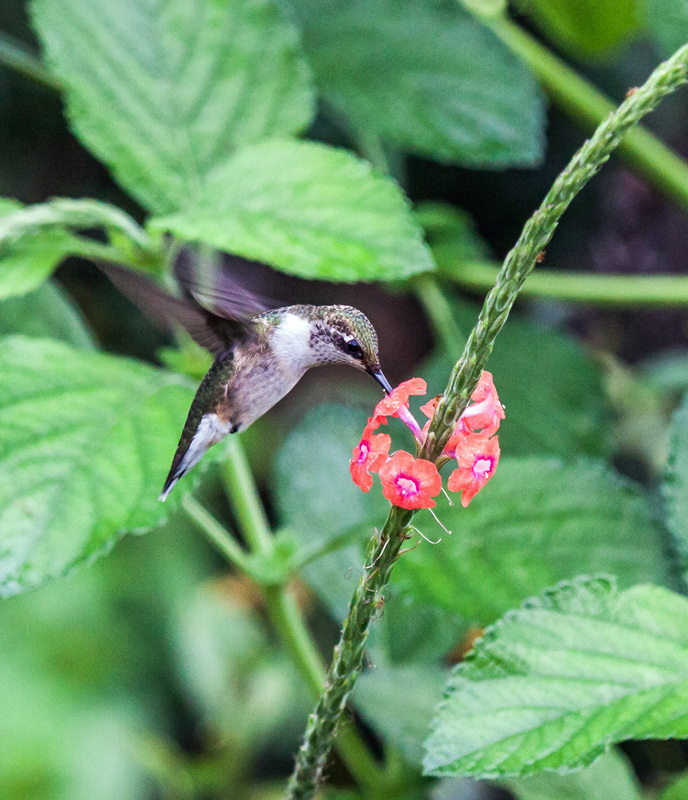 I have a few more hummingbird shots that I may use in another posting, but wanted to share these initially. I love these photos, they are such wonderful little birds and to me the blurry wings add a lot of charm and action to the photos. I’ve only had the privilege of seeing them once in my life, when we were in LA and I spotted them in a planted area in between streets. Great shots Mike I rather like a bit of motion in the wings, it gives it life. Wow Mike, these are beautiful and I think a small amount of blur in the wings gives that sense of the bird’s super speedy humming… better than a bird frozen in mid air! I love these! Ours are still here in Ohio. Won’t be long before they depart. 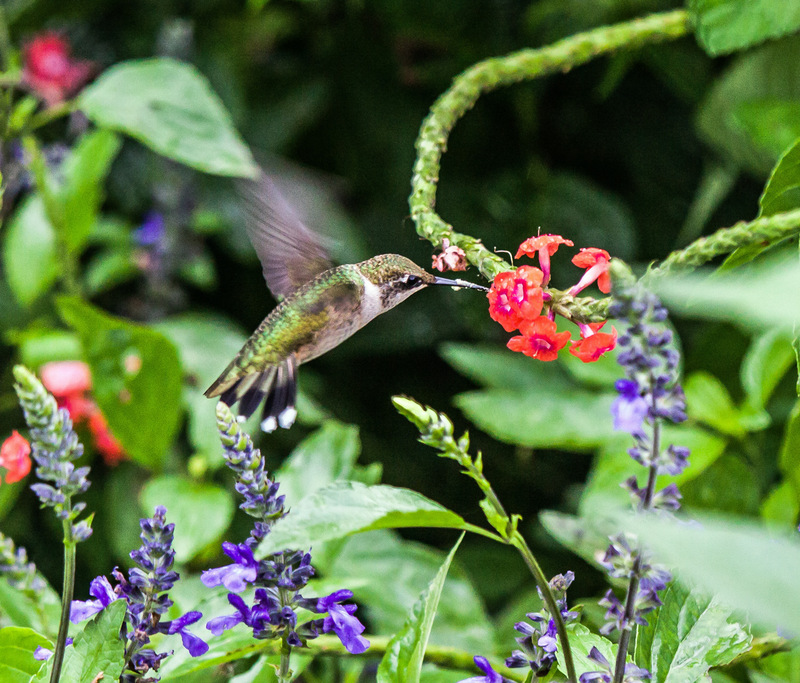 Hummers love red flowers best. Ours seem to have gone for the season. I always wonder where they end up spending the winter? Spectacular photos, I am super impressed by how sharp you got the images of these hyper-speedy wee birds. Beautiful close up shots! I need to share these with my Aunt who loves hummingbirds. She can stand by her feeder really still and they will at times perch on her shoulders. 🙂 Ha Ha about holding the umbrella with one hand and the camera with the other. That is a dedicated photographer! Great shots, Mike! I love hummingbirds. We have a feeder in front of our kitchen window where they come and go all day. They argue and chase each other and greedily drink the sugar water, buzz away, buzz back, like tiny drones. I wish them a safe trip. Did you know they fly over the Gulf of Mexico, not around it as most migrants do? If they encounter a storm, they usually perish, because they are able to store up only enough fuel for an uneventful crossing.